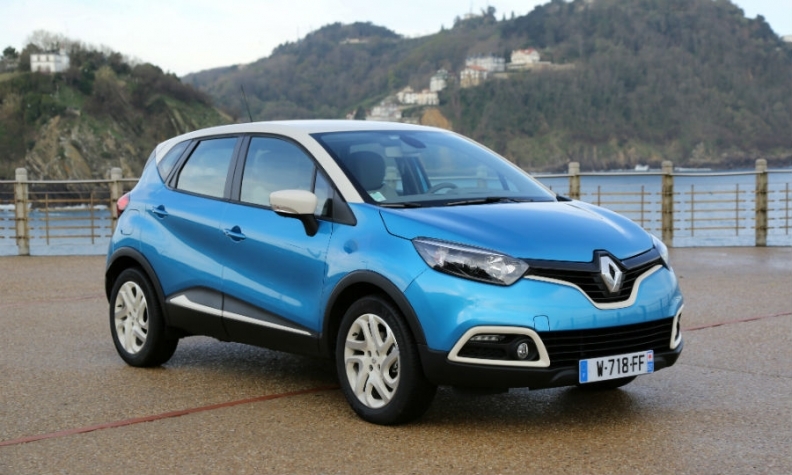 Renault is being asked to explain the Captur's high NOx emissions. PARIS -- Renault executives will meet French government technical experts to explain why its Captur and two other diesel models have NOx emissions limits far higher than legal limits, a French newspaper reported. Ford Motor and Mercedes will also come under scrutiny after two of their models also had excessive emissions, Les Echos newspaper reported on Saturday. Preliminary results from tests ordered by France's energy department indicated that emissions from the Captur SUV, an Espace minivan and an unnamed Renault utility vehicle exceeded limits. The Ford C-Max and Mercedes-Benz S class models that were tested also had emissions much higher than legal limits, although not as much as the Renault models, the paper said. The government is particularly concerned about the Captur because it is a relatively new model which meets the Euro 6 standard that is supposed to allow only "clean diesels" on the road. The Espace and utility models tested met the Euro 5 standard. One source told Les Echos that the Captur may have a technical problem in its pollution control system that could lead to a recall. The Mercedes S class 350 that was examined gave inconsistent results while the Ford C-Max had emissions five times above the allowable limit, the paper said. Technicians tested Euro 6 versions of both cars, it said. Ford said all its vehicles and engines meet current French and European emissions regulations carried out in laboratories under legally mandated tests. "Unofficial on-road testing has varying conditions and can produce significantly different results," a Ford of Europe spokesman said. Ford supports changes to the testing to better reflect real world conditions," the spokesman said. "Importantly, we do not have any so-called defeat devices in our vehicles." Les Echos said the vehicles underwent three tests: the standard New European Driving Cycle (NEDC) laboratory examination used to establish whether vehicles meet EU limits, plus a road test that is not currently part of the official EU procedure, as well as a test to check whether the vehicle used a defeat device. Government inspectors plan to examine 100 vehicles and have tested 22 so far, according to Les Echos. The Volkswagen Tiguan and Audi Q3 models that were tested had defeat software while a Peugeot 208, a BMW 3 series and unnamed Toyota showed no particular problems, the paper said. Renault will be expected to explain to officials at a meeting Monday afternoon why emissions exceeded the limits and how it will correct the problem, Les Echos said. Ford and Mercedes have been asked to explain the results from their vehicles. France started a probe into diesel cars in September after Volkswagen admitted to rigging emissions tests. France's Energy Minister Segolene Royal said on Thursday there was no sign that Renault had fraudulently concealed emissions with defeat software. Last week Renault said fraud investigators had inspected three of its sites in an emissions probe, raising the specter of a Volkswagen-type scandal at the French automaker. The company will present a plan to address the gap between its vehicles’ emissions in real-world and laboratory tests within weeks, the automaker's sales and marketing chief, Thierry Koskas, said Monday at a press conference in Paris. "Renault hasn't cheated," he said.